ORLANDO, FL — Disney announced last week that they are raising their park entry fees once again to $99 per day. They were unapologetic for the rise, even midst some of the strongest earnings their top executives have ever seen. The official spokesperson, dressed as Minnie Mouse, would say only that her bosses feel like they are getting the short end of the stick when it comes to executive salaries. Ms. Mouse was immediately whisked away, after taking off one of her size 23 white pumps and tossing it at the Sr. VP of Marketing at Disney, and another spokesperson taking her place, Mickey Mouse, had this to say. “She was under a lot of stress. She was making less than minimum wage and asked to work longer hours, and well, it just got to her. She swooned is all when she started reading all those numbers, and well…” at which point Mr. Mouse lost his Disney magic demeanor as well, and lunged at the Sr. V.P. Mr. Mouse was then whisked away and in his place came a young lad, who looked to be around 16, wearing a barbershop quartet outfit, who mostly just sang and danced his way through the rest of the press conference. 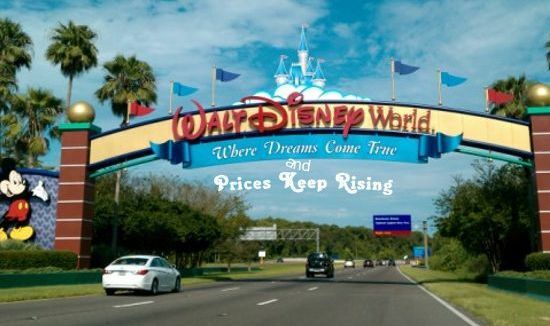 Disney sources did say that park prices will continue to steadily increase, and they prided themselves on the fact that no matter what they charge, the people will come. At least the people who can afford it, which most analysts predict is at the core of the steadily rising prices. Disney feels their tactics in pricing will ultimately drive off the riff raff to other, less costlier entertainment, such as opening fire hydrants on a hot summer day to cool off in the absence of air conditioning, that sort of thing. “They like that,” said one unidentified spokesperson, dressed as Uncle Scrooge McDuck. And added “Where else in the world can you offer the same tired rides over and over and over again, and keep charging more for them, and still have people line up in queues to get into your park? This is something even Mr. Walt Disney couldn’t have imagined.